This is part 17 of 20 in a series about the Pentateuch, the first five books of the Bible. In it we will explore the context of the book, specifically its relationship to the Egyptian culture of its day. Anyway, God enacted a series of laws last week, of which about 70% were what could be called secular laws that had nothing really to do with YHWH at all. So last week, He told the Hebrews how to govern their nation. This week, He tells them how to worship their God. Because of the length of this passage, I'm not going to list every single detail. Instead I will cover it in sections, expanding some sections for more interest; if you want more details you can, of course, just pick up your Bible! The first thing God does is establish the physical accessories to worship--what does worship look and feel like? He funds this through a one-time special offering from all people due to the debt they owe God as freed slaves (Exo 25:1-9, 30:11-16). The execution of all these commands (including the immediate sin of worshipping a golden calf) are recorded in Exo 31:1-40:38; feel free to read them there. But what I want to focus on is the main purpose of this passage--the architecture God designs for worship. There are many parallels here to note here for the Christian. They did altar sacrifices; Christ was our once-for-all sacrifice. They had a basin for becoming clean in order to approach God; we under baptism as a sign of washing away our sins. As an act of worship, they place the Bread of Presence at the table; we celebrate the Bread of Life (Jesus) when we take communion in our act of worship at the table. This is not the massive, expensive architecture of later Judeo-Christian years, or modern day churches. This is a small, inexpensive, debt-free approach to worship. This is God dwelling in a tent among men, so that where-ever we go, He goes. The whole place of worship is able to be funded in cash with a one-time donation and constructed by volunteer work , and moved whenever the people move. It is a place of humility, looking nothing like the elaborate shrines and temples of other religions in the ancient world. Stop and think about this for a minute. God the Creator of the Universe, when designing His house of worship, designed the tabernacle above. Simple, debt-free, portable, and--by comparison to other religions--very plain (notice that the table and ark are gold-plated, not actual gold!). God wants His house of worship to be different from common life--set apart, holy. He wants your mind and attitude transformed when you enter it. As a result, He makes it different from anything they see in day to day life...and He makes it in such a way that all of the senses feel it. 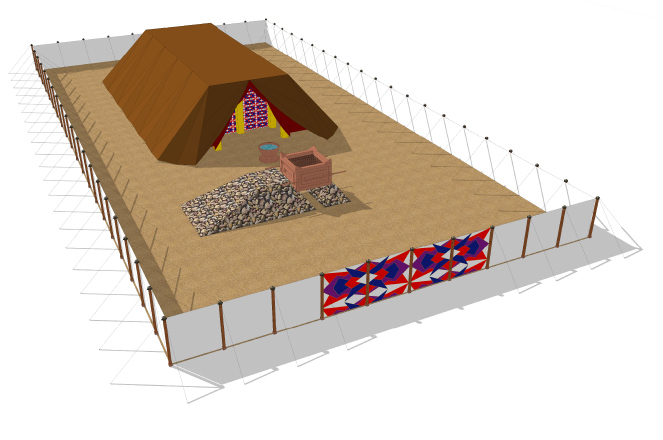 You must enter a courtyard fence, so that the tabernacle is literally, visually separated from the outside world. The inside looks different from anything else, with an altar prominently in the middle. You have to wash to go inside, so that you feel and look different. Light comes from a unique and memorable lampstand, unique from others. The tabernacle smells different than the rest of the world, due to the daily incense burning. The gold plating makes it look different and special and awe-inspiring. The priests wear different clothing and special perfume so that they look and smell different than the average person. The point is that the entire theory behind God's architecture seems to be to create a sense of otherness. The desire is to be different than what the rest of the world sees. Compare this to modern Christianity, with its focus on being exactly the same as concerts/lectures/etc, in buildings that look like strip malls. Today we try to design our worship to be comfortable and accessible, whereas God designed worship to be different and memorable. Having established the architecture of worship, God now moves on to the rituals and rules of worship. The priests, called the Levites, are responsible for the administration of these rites: thus, they are collectively known by the name "Leviticus." So in general, the book initiates the priestly system, then tells how to be ritually pure in order to be ready to meet God in worship, and then how to be holy/set apart. When most people think about the Jewish Law, they think about Lev 17-25, the holiness code: these are the rules God designed to visibly separate the Jews from everyone else, and make them a priesthood for Him. This also causes a lot of confusion among almost all non-Christians (and most Christians, to be honest): why is it okay for Christians to ignore all of these sections of rules except for Leviticus 18? Why is that the only one that matters? I have talked about this briefly before, but it is worth revisiting. Obviously all of these laws are designed for the descendants of Jacob. These are the laws and commandments of the Jews--and the Jews are both an ethnicity and a religion. So when Peter and Paul began spreading Christianity to the Gentiles, the question became, "Do they have to convert to Judaism?" Obviously they are not ethnically Jews, but Christianity was seen as the true completion of Jewish religion--so can one be religiously Jewish without being ethnically Jewish? A council was called in 51 AD of all the early Christian leadership, as recounted in Acts 15:1-35. After all the early church leaders debated, they agreed that Gentiles need not convert to Judaism and follow the Mosaic Law in order to be a Christian. The first half (food sacrificed to idols, blood, strangled animals) means basically, "You cannot worship other gods." Pagans strangled (rather than exsanguinating) their sacrifices, drinking and eating the blood of the animal in worship of false gods. Obviously you cannot call yourself a Christian if you are worshipping other gods. The second half is that we must be free of sexual immorality. What is sexual immorality? Well...not to put too fine a point on it, but it is Leviticus 18. So when people ask, "Why do you eat shellfish (outlawed in Lev 17) but condemn homosexuality (Lev 18)? Isn't that hypocritical?" For a Jewish Christian, you could make that argument. But not for Gentiles...we were never under the Law to start with. When the great followers of Jesus (Peter, Paul, James, etc.) got together and discussed what Jesus taught during His time with them, they agreed that we Gentiles are freed from all of Mosaic Law...except for the two things which separate us from God most severely: worship of false gods, and sexual immorality. Two weeks ago, we saw that God freed the slaves from Egypt. Last week, we saw God set up a set of (mostly) secular laws to be able to lead His kingdom. This week, we saw God set up the rules of worshipping Him -- first designing the architecture of worship, and secondly defining what sets His chosen people apart from the rest of the crowd.